Observations and commentary on all things Boston, and beyond. We've been living in Boston for about 7 years now. Every day, our commute takes us into the bowels of Back Bay station along with thousands of other rat-racers. And every time it rains, all of us have to be extra careful to watch our steps, avoid the variety of orange cones and yellow tape blocking off sections of the station due to the absurd amount of leaks in the roof. Mayor Tom Menino has said more than once that he considers Boston to be a "world class city". Maybe he should let the MBTA in on this view. Funny, but I can't imagine New York's Grand Central Station, or Paris' St. Lazare train station ever subjecting its tax payers to watery obstacle courses. Granted, Back Bay isn't as large or busy as North Station or South Station, but in a city deemed by the current, long standing Menino administration as "world class", can't someone find the resources to fix the roof? Talk about making a horrible fist impression upon national and international tourists (who we depend upon to infuse needed revenue into our local economy) and students (thousands of which are enrolled in our colleges and universities) who must wonder how a city like Boston can allow the continued disrepair. And not just commuters are affected. as this poor vending business owner has to battle torrential rain INSIDE of the station and all around his equipment. 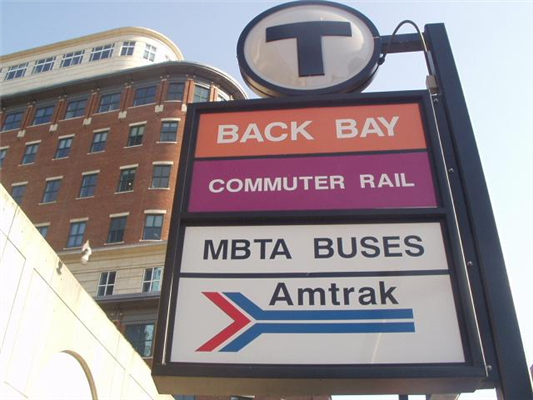 The following is MBTA fodder for another day and another posting, but methinks this information might be contributing to the cause of the lack of basic station infrrastructure. See what I'm talking about here. In particular the "One day/one year provision" which grants some public employees an entire year of creditable service for as little as one day of work which can boost a pension by thousands of dollars a year. Thank god MBTA workers have the ability to drain the taxpayers in so many ways. Now, where o where can Boston find money to patch leaky roofs? If Boston really is a "world class city", then is it too much to ask that basic building maintenance of one of the city's three major stations be addressed? Maybe we need to reconsider what it means to truly be "world class".